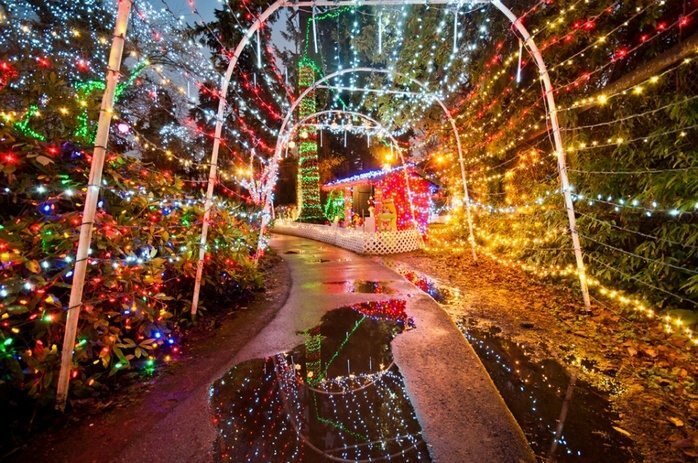 Vancouver Mom > Holiday > 15 dazzling holiday light displays in Metro Vancouver! The days are short and the nights are dark. Thankfully, twinkly lights are here to brighten our dark evenings as the holidays approach. Vancouver has everything from jaw-dropping spectacles to flashy neighbourhood displays. There’s no denying the magic of holiday lights. And there’s no shortage around town! Here are a few places sure to light up your night and put you in the festive spirit. 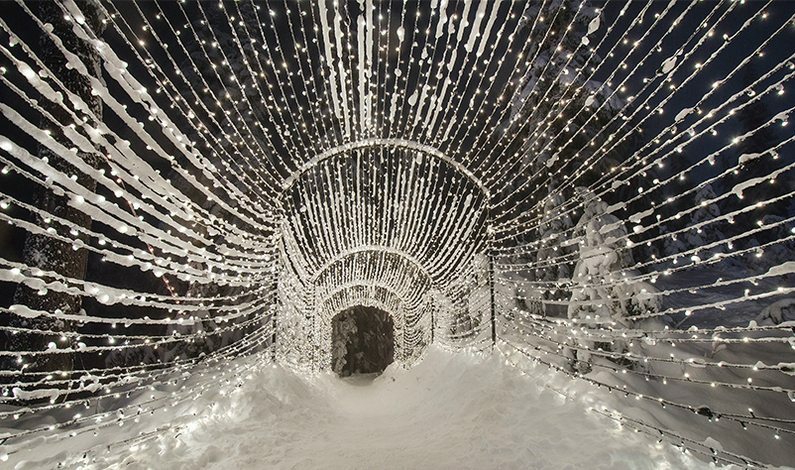 This sparkly installation is an all out ode to Canada complete with Aurora Borealis, glittering Narwhals, moose, reindeer, cherry blossoms, weeping willows a mystical maze, an outdoor skating rink and even a candy coloured Ferris wheel! Experience magic in the trees on this enchanting Light Walk up on top of Grouse Mountain. Start at the glowing light tunnel (and excellent photo op! ), then walk among the fir and spruce around Blue Grouse Lake where stunning light installations bring radiance to the winter night. Twinkling lights set against a snowy mountain backdrop are definitely worth the trip. Check out our Top 100 kid friendly holiday activities list! This is a evening great adventure with kids. Huge parts of the gardens are lit up (1 million lights in fact) in a dazzling display. 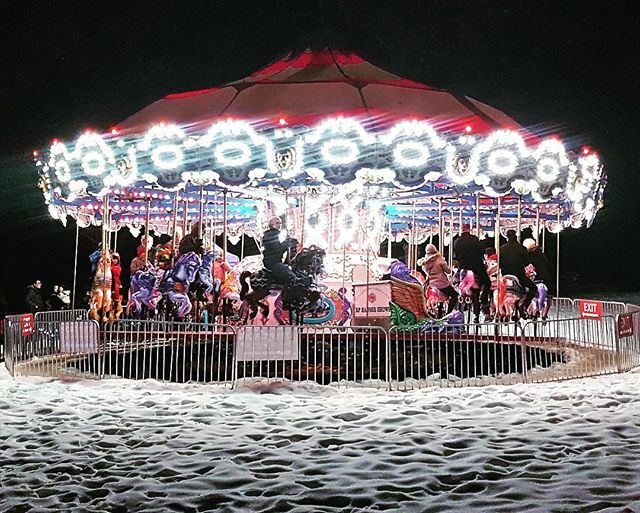 There are the “dancing lights” on the central pond, a carousel, sweet treats, real food, and hot chocolate on offer, as well as a lovely Santa in his living room. It’s worth noting that tickets are on the expensive side, as are the drinks and snacks, and parking can be a bit of headache. However, it is a truly exceptional display. Wander across the suspension bridge all lit up with twinkling lights and wander across the various tree top bridges on the other side. Marvel at the world’s tallest living Christmas tree (153 feet tall!). Check out the daring light show on the cliff face. There’s also cookie decorating, hot drinks, live music and plenty of photo ops! NB: you can’t take strollers on the bridge or the Cliff Walk, so best be prepared with a carrier. The parking fills up fast, so aim for early evening on a weekday if you can. One single house in North Vancouver puts up more than 1,000,000 lights at Christmas time. The work begins a couple months in advance, and this family project is a true labour of love. This year, they are collecting donations and 100% goes to the Harvest Project, the BC Epilepsy Society and Shriners Care for Kids. A 1.2-kilometre trail loops this popular urban lake in Town Centre Park, offering views of both mountains and cityscape. Prepare to be dazzled by the Lights at Lafarge winter display. Walk the lakeside circuit after dusk to take in the hundreds of thousands of lights across multiple themed zones. All aboard the Christmas train! A favourite adventure for Vancouver families, the Christmas train winds through holiday light displays and past live performers on a 14-minute ride. Wander around the train plaza before and after to see all the little Christmas displays and lights. Snacks, hot chocolate and more are available around the train plaza. Buy your tickets online, or drop by in the morning to get same-day tickets. Parking is free, but fills up fast. There are matinee trains for small people who fall asleep too early for the night train. This annual holiday light display will be glowing up the waterfront of the Harrison lagoon. The inaugural lighting occurs at 5:30 pm on Saturday, November 24th with pre-lighting festivities including complimentary hot chocolate and treats, a roving Sasquatch, and a few other surprises. This glittering display at the Milner Garden Centre in Langley features 103,000 square feet of lights including four Christmas-themed light gardens, LED swings and hopscotch, a glow-ca-motive, magic castle playground, a musical light tunnel. Kids can help Santa find his lost presents scattered throughout the light gardens while parents wander through the Christmas market. For food and libations, there are food vendors, real drinks and food trucks. PS: It’s all indoors so no need to pack an umbrella! Annually, the towering wall of lights at St. Paul’s Hospital on Burrard are lit. This spectacular eye-catching scene never disappoints. There’s no fee (except for optional donations you can give to support the hospital) and it’s on all season long. The 2400-2900 blocks of Trinity Street, near the PNE, is home to a stretch of incredible residential Christmas lights that will blow your mind. 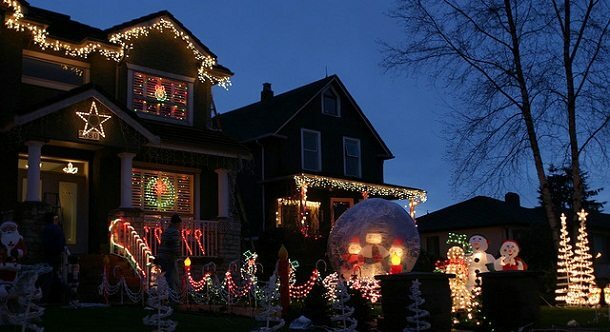 Each year, neighbours engage in some friendly light display competition. But there’s also carolling, hot chocolate stands and so much more! Try and park a little way away and walk down, or take transit, as there’s no parking on Trinity itself. There are several good viewing spots to see the Carol Ships glide past, including Granville Island and Olympic Village, which both have good hot chocolate near by! Listen to the choirs singing on the ships as the songs travel across the water. Check the sailing schedule to see where the ships will be when. Bundle a couple of these Christmas lights experiences into one night, with a happy carol-singing trolley ride in between! 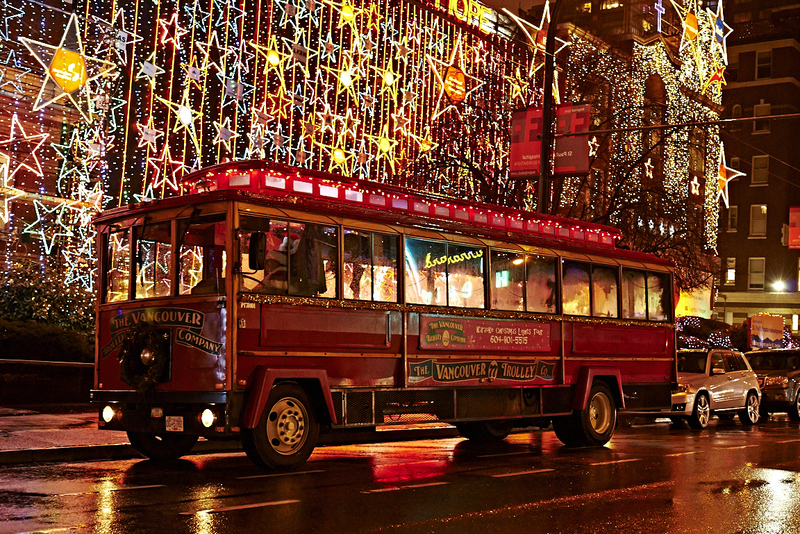 The Vancouver Trolley runs their Karaoke Christmas Lights tour all December – hop on their specially decorated trolley bus downtown, equipped with karaoke machine, and sing all the way to Stanley Park where you can take in the display around the Bright Nights Train (though not an actual train ride). The bus sings its way up to VanDusen for a tour of those lights too. Book ahead, these fun trips sell out quickly. This spectacular annual Christmas display at a private home in Langley features 44,000 + lights. It all takes place at 20681 44 Ave with all donations going to the Vancouver Children’s Hospital by Carla Fraser and Brad McLean. The Lumiere festival may be over but three of the majestic installations will be up until January 2009. So take a wander along English Bay after sunset for a sparkly look at Luna, the orphaned orca, Stanley, the blue heron, and Eugenia, the iconic oak tree, which all pay homage to their local surroundings. In the News: Vancouver Mom’s Top 5 Holiday Light Display picks!